Education: Berklee College of Music, California State University at Long Beach, Bachelor's Degree in Music Education from San Diego State University. Private Instructors; Saxophone: Charles McPherson, Andy McGhee, Leo Potts and James Rötter. Professional Playing Experience: Bobby Hutcherson, Kenny Werner, Bob Berg, Dave Liebman, Mike Zilber and the CARMA Big Band, Donald Harrison, Steve Smith (Journey & Vital Information), Jeff Chambers, Rodney Holmes, Doc Severensen, Phil Woods, Hal Crook Big Band, Mike Vax Big Band, Mike Wofford, Peter Sprague, Lou Rawls, The Temptations, The Four Tops, The San Diego Symphony, The Classical Philharmonic, and many others. 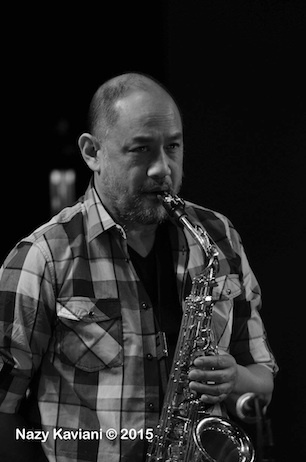 Leader Experience: Co-leader of the Subterraneans, a contemporary jazz group based in San Diego, and leader of several other groups for private functions in the San Diego area, and currently leader of his own jazz group based in Oakland, CA. Composition: Larry has written original material for The Subterraneans, New Shooz, The MUSE Band Program, Lorraine Doyle, Flight 7 and his own group. His original composition entitled "Mistral" was featured at the 1999 Monterey Jazz Festival with the Mike Zilber Big Band. He has done several arrangements for big band, saxophone quartet, commercial jingles, pop music bands and school band programs. Television: Larry has appeared on national television in a mini-series called "Deadly Games" starring Edward James Almos and Beverly D'Angelo, where he plays saxophone in a few of the scenes. He also has appeared on various musical events and news spots that featured his playing. Teaching Experience: Larry has taught private lessons in saxophone and piano since age 14, and has taught at several summer camps for High School Band, and currently teaches at the Cazadero Family Music Camps each summer. Also, he taught jazz theory and composition at the JazzSchool, founded by Hal Crook in San Diego, CA.